The SCR19-H and SCR39-H Series power controllers are designed to proportion electric power to resistive loads only, such as ovens, furnaces, heat sealers, etc. The controllers consist of power semi-conductors (SCRs), properly sized heat sinks, trigger circuitry, and fuses supplied on panels for surface mounting. (Note: They are not designed to drive transformers or any inductive load.) The power controller accepts a 4 to 20 mAdc output from a temperature controller. 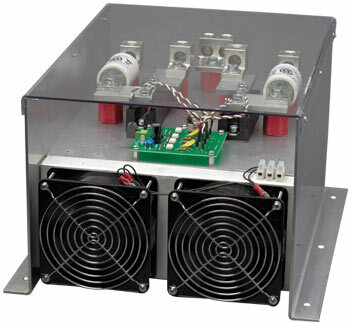 The SCR19Z-H and SCR39Z-H SCR power controllers are zero crossover fired, high-power solid state switched devices. Zero crossover firing eliminates the RFI generation associated with mechanical relays. With zero crossover firing, the output appears as bursts of full sine waves of line voltage which provides excellent regulation to the load. The SCR19P-H and SCR39P-H SCR phase-angle fired power controllers turn on each SCR for a controlled portion of a half-cycle of the line voltage. The effective line voltage is determined by the portion of the line voltage delivered, which is proportional to the input control signal. Additionally, the voltage is regulated as the line voltage changes. Dimensions mm (inches): Note: When fuses are added to unit, add 83 mm (3.3") to height. Note: To Order Phase-Firing Models, see Part Number Builder section below. 참고: All phase-angle models come complete with 1 fuse per SCR line controlled, and operator’s manual. All zero-voltage models come complete with 1 fuse per SCR line controlled, and operator’s manual.